Don’t be so blue, Neil Armstrong (as played by Ryan Gosling in First Man). For a movie about going to the moon, First Man sure is grounded. That’s a good thing though, mostly, as the film provides a layered and at times painful look at what that legendary trip cost not just America but also astronaut Neil Armstrong. However, First Man is not a hugely patriotic roller coaster like Apollo 13. Director Damien Chazelle has taken one of humankind’s greatest adventures and turned it into an intimate character portrait. It’s engaging and emotional, but just the slightest bit underwhelming. 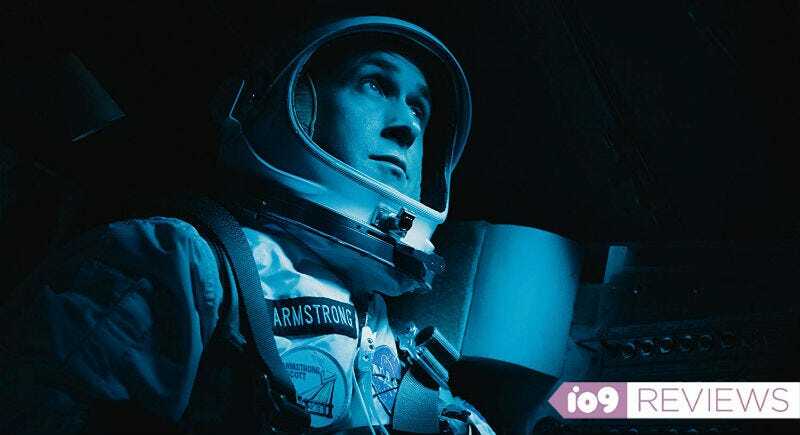 First Man, written by Josh Singer from a book by James R. Hansen, is the story of Neil Armstrong (played by Ryan Gosling) who, as we all know, is the first person to ever walk on the Moon. The film starts long before that, though, with Armstrong as an up-and-coming pilot and engineer with a flair for danger who rises through the ranks to become an astronaut. From there, the film spends most of its time going step-by-step through the various obstacles NASA had to overcome before the moon landing—the money it cost, the political posturing it took and, most devastatingly, the lives that were lost. Most of us never think about those things when it comes to the Apollo 11 mission, we just think about the ending. But First Man is all about that journey. Close-ups like this are a staple of First Man. Much of this is seen through the eyes of Neil’s wife, Janet Armstrong, played by The Crown’s Claire Foy. She is given most of the heavy lifting performance-wise, showing a full range of emotions which contrasts with Gosling’s stoic take on Neil, as the couple deal with professional failures, an overly eager press, and the deaths of many people close to them. Their vastly different reactions to hardship add yet another layer of drama to the film, because it causes tension in their marriage. Chazelle shows us all of this through a frame that’s very often in extreme close-up or first person point of view. He wants us to feel what the characters are feeling or, at the very least, be forced to think about it. Even when First Man is soaring through the stars, the point of view is almost always closed off. So, when a rocket takes off, the camera doesn’t give us a lot of big, wide shots of the ship majestically rising through the sky. Instead, the camera stays inside with the astronauts, looking out of a small window, showing just a tiny sliver of the bigger picture. That tiny perspective of a larger scene happens again and again in the film, giving the whole thing a fly-on-the-wall viewpoint on this otherwise epic story. It’s all about keeping things personal. Gosling and Foy’s characters have a complex relationship. And yet, those techniques buck up against a lifetime of conditioning. Everyone has heard stories of what the moon landing meant to the world at the time. It was a grand, unprecedented event. So watching First Man, which is at times a bleak, difficult character study, there’s always the promise of this cathartic, wondrous moment on the horizon—and with it, a rare glimpse of happiness for the Armstrong family who has had to deal with so much death and disappointment to get to this moment. And while those iconic moon landing scenes are filmed beautifully, especially in the IMAX format, First Man’s constricting camera work doesn’t allow them to line up with our possibly unfairly high expectations. That inflated sense of adventure and excitement we associate with space travel and the moon landing are rarely on display here. Even in what should be its biggest, most epic moments, First Man can seem like it has blinders on, and the result is a disconnect between expectations and reality which leads to just a little bit of disappointment. Nevertheless, First Man is a worth your time. It’s a film that made me realize landing on the moon was even more incredible than I ever imagined, and that the people who made the journey had to go through more pain and heartache than I ever realized. And it made me struggle with the question of whether the price the Armstrongs and the other astronaut families paid was worth it. It’s a beautiful, complex, illuminating film that happens to stumble ever so slightly. First Man opens October 12.